Return to By the Book -- Activities for Book Week! Lend a hand to the library! Recover damaged books during Book Week! design a new cover for the book based on its content. vote on the most eye-catching and interesting cover. In preparation for this activity, gather damaged books from your classroom library or ask the school librarian to choose some age-appropriate books in need of repair. Students may work on the assignment in class or create their covers as homework and return the covered books to class. Using examples from the damaged books you have gathered, have students identify the information contained on most book covers. Your class's list should include title, author, illustrator, publisher, description of the book, and any other relevant information suggested by the examples. Compare some of the book covers. Are some more interesting and appealing than others? Why? Discuss what makes an attractive and effective book jacket. What is a publisher's goal in designing a cover? Distribute the damaged books to individual students or groups. You may permit students to choose a specific book or hand the selections out at random. Give the students a set amount of time to read the books. (Selections should be age-appropriate.) If the books are long, postpone the rest of the activity for several days to allow students to read the material. 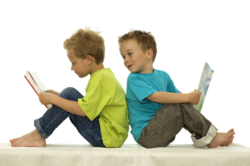 If they are short books or picture books, have them read the books during class and continue. Instruct students to outline the design of a new cover for the book on paper that includes all aspects of an excellent book cover as the class has defined. Make sure text has been prewritten and edited for the book description. As they complete their designs, have the students share their work with you and get approval to move on to the next phase of the activity -- creating the cover. Provide paper bags or thick paper and art supplies for students to use as they work. The Book Covering Party page on the Family Fun Web site provides ideas for a variety of book covers that students can create. When students have finished, again examine the book covers and help students proofread their work. If desired, have students add a layer of clear contact paper to the book cover to preserve it. Then the students may fasten their covers securely, without taping them directly to the books. Put the books with their new covers on display. Hold a vote within your classroom for the cover that is most inviting -- a cover that encourages readers to read the book inside! Collect book covers and evaluate writing according to grade-level standards. A satisfactory submission must contain the title, author, illustrator, publisher, a description of the book, and any other relevant information deemed appropriate during class discussion. Click to return to this weeks Lesson Planning article, By the Book -- Activities for Book Week! See additional Book Week ideas from our Celebrate Childrens Book Week archive.